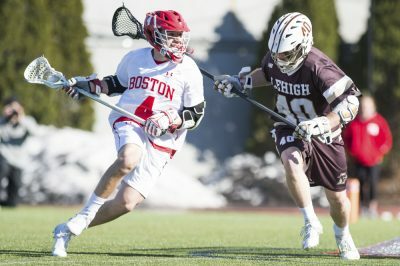 After its must-win game against the College of the Holy Cross last Friday night to take the final spot in the Patriot League playoffs, the Boston University men’s lacrosse team proved that it wasn’t ready for its season to end. The Terriers (8-7, 3-5 Patriot League) pulled off a 12-11 upset over No. 10 Bucknell University Tuesday night to move onto the semifinals for the second consecutive season. BU trailed the Bison (11-4, 7-1 Patriot League) for a majority of the contest until freshman attack Chris Gray provided a game-tying goal with 10:41 remaining in regulation. Junior attack and midfielder Brendan Homire, off a feed from Gray, then extended the Terriers’ lead for the win, thus ending Bucknell’s six-game winning streak. Recent Patriot League Rookie of the Year winner Gray played a large role in the final decision of the game, putting up nine points — five goals and four assists. BU head coach Ryan Polley noted Gray’s importance in the game and his playmaking skills on the field. Sophomore goalkeeper Joe McSorley also maintained a strong presence in the net, especially in the waning minutes of the matchup, and finished the night with 12 saves. Junior defender Quintin Germain limited Bucknell’s leading scorer senior attack Will Sands to just two assists. Additionally, the rest of the defense held the Bison scoreless for the last 21 minutes and four seconds of the contest. Bucknell junior midfielder Tom Smith struck first and his team went on to tally three more goals in the opening quarter, but junior attack James Burr cut the lead in half before the end of the frame. Smith continued his dominance in the second quarter with two unassisted goals, and the Bison would end the half with a 7-4 lead. Senior attack Jack Wilson and Burr found the back of the net to get the Terriers within two goals just under five minutes into the second half, but Bucknell responded with three straight goals to extend its lead to 11-6. However, it was senior midfielder Hayden Ruiz who would spark BU’s comeback. The Rancho Santa Margarita, California native got the ball to senior midfielder Greg Farris on the man-up opportunity before setting up Gray. Then with two seconds remaining in the third quarter, Ruiz got the ball past Bison junior goalkeeper Christian Klipstein to bring the score to 11-9. Ruiz finished the matchup with a career-high four points. In the final quarter, Gray had a part in the last three goals — providing assists on both of Homire’s goals and a marker himself. BU had to kill off two penalties in the remaining five minutes of the game, but its defense held out for the win. McSorley also made a key deflection with 35 seconds remaining to keep the Terriers’ one-goal advantage. This marks the first time since 2015 that BU has beaten Bucknell, and the first time the Terriers have beaten an opponent ranked in the top 10. 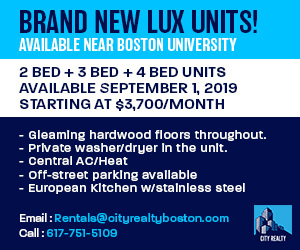 BU will now take on the No. 1 seed Loyola University Maryland on Friday afternoon.